Known for its colourful range of flat and clipless pedals, Taiwanese brand HT Components has been plugging away at the pedal market since 2005. 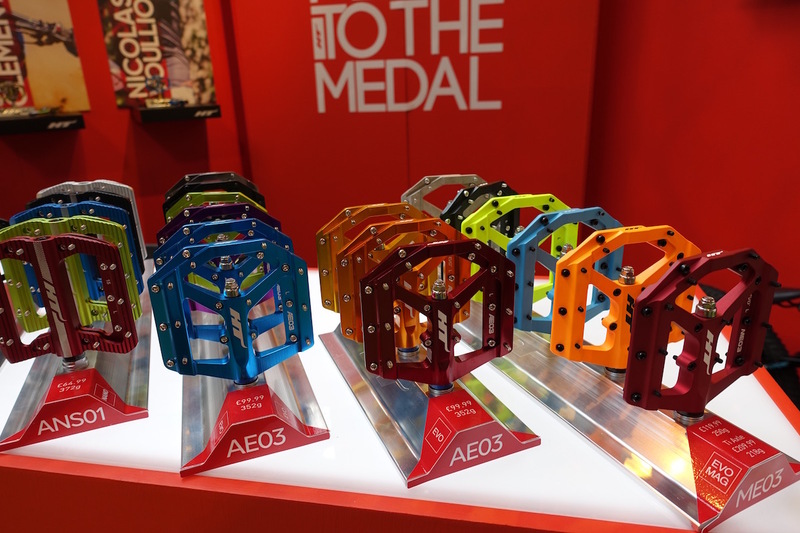 Its parent company, Hsing Ta Industrial, has been around for a lot longer, having been producing all sorts of bicycle components since the 1950s. HT Components is the high-end offshoot of Hsing Ta Industrial (kind of like what TRP is to Tektro), and its focus is on high-end pedals. 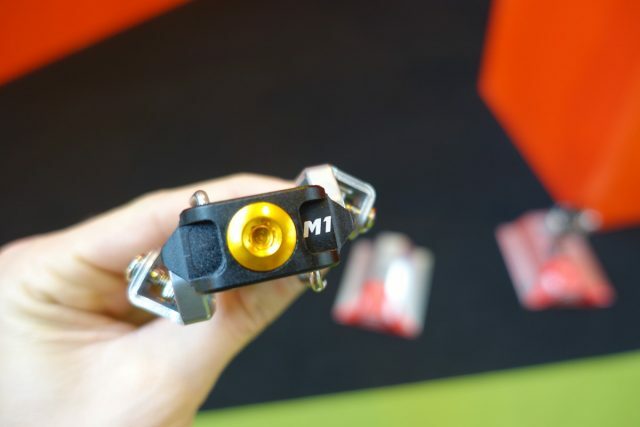 While most people would think of Shimano or Crank Brothers when it comes to clipless pedals, HT Components offers a solid and distinct range of pedals for those who like to mechanically attache themselves to their bikes (and not with magnets). 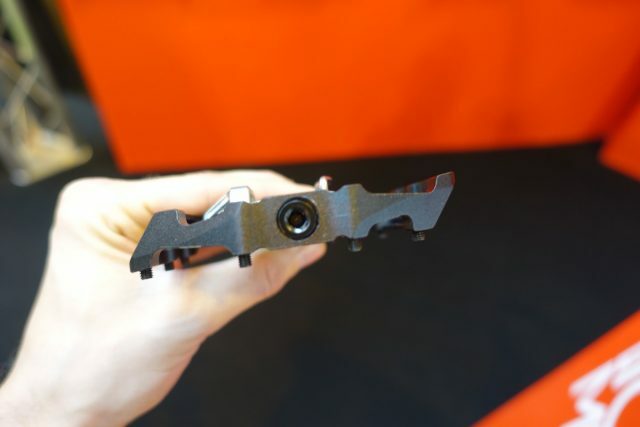 At the Cycle Show in Birmingham, HT Components was showing off some of their latest clipless pedals, as well as redesigned flat pedals that feature new and more durable internals. Taste the rainbow baby! 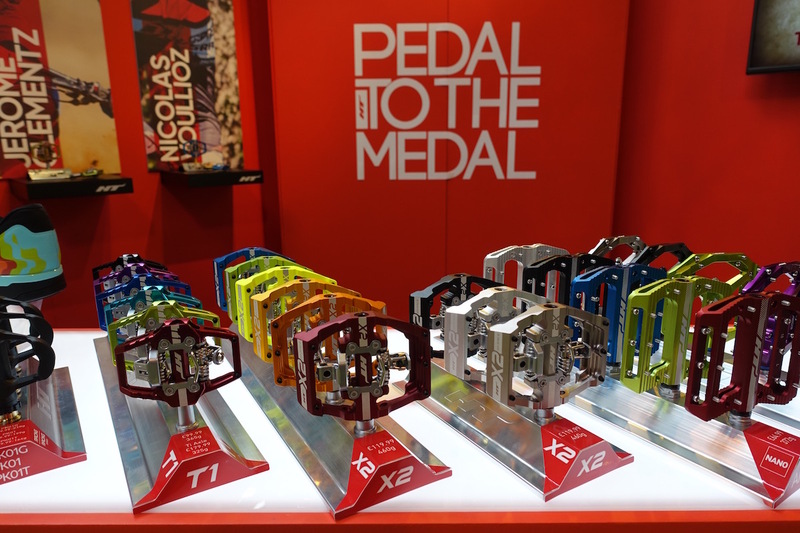 HT Components offers a wide range of colours for their clipless and flat pedals. We’ve reviewed the HT AE05 flat pedals previously, and they proved to be a quality flat pedal option for those who like a nice thin pedal underfoot. HT Components offers various shapes and sizes for their flat pedal range, so you can find the right platform for your shoe. The biggest change to their 2017 pedal range is an update to the EVO+ internals, which combines a needle cartridge bearing with an IGUS bushing for increased support and easier servicing. Recognise those shoes? 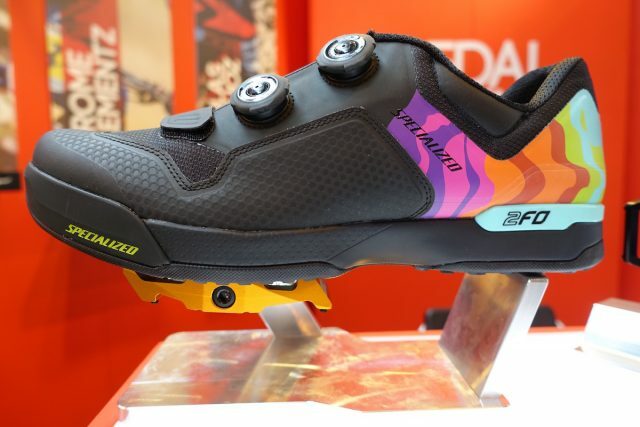 They’re Troy Brosnan signature edition 2FO kicks from Specialized, which HT Components had on display with the trick X2 clipless pedals. 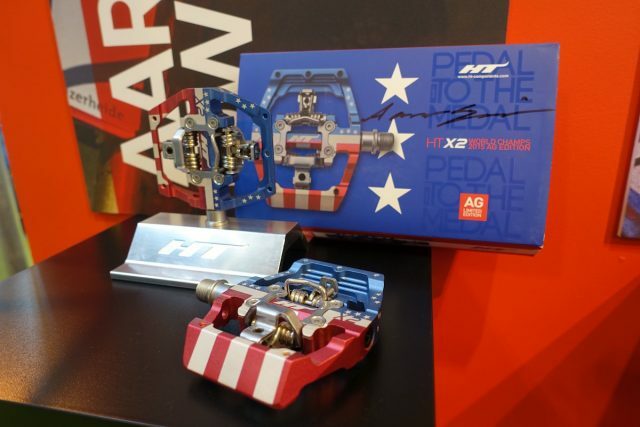 The X2 pedal features a CNC machined alloy body that is 85mm wide, by 94mm long. Stack height is just 14mm, which is damn thin for a clipless pedal. Adjustable pins for extra grippage with your shoes. 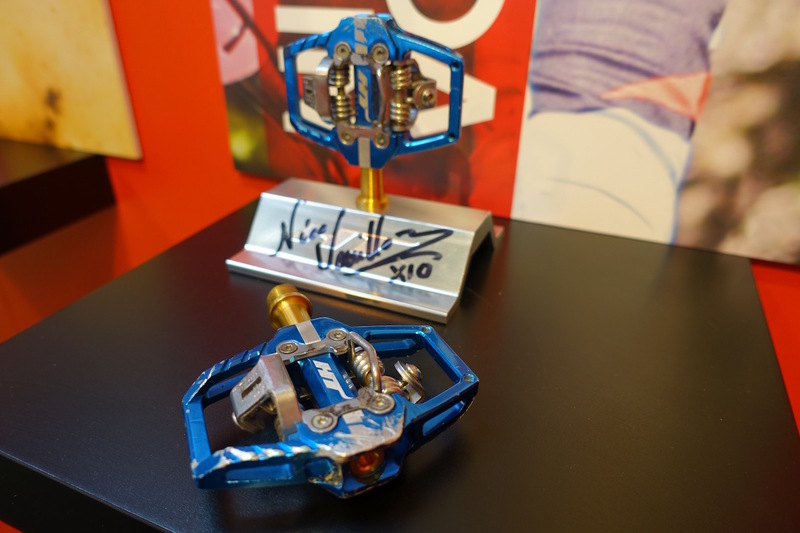 There was plenty of other signature bling on display at the HT Components booth, with a few special edition pedals having been signed by some of HT’s sponsored athletes. As you can probably tell, those are some pretty big names in mountain bike racing. 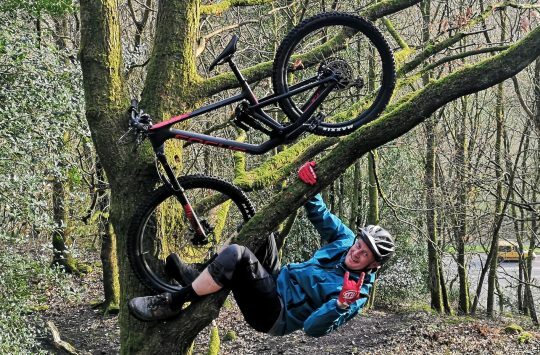 That’s worth noting because pedal preference is highly personal, and World Cup level riders are often known to seek out their preferred sponsors to ensure they have pedals that they trust in. 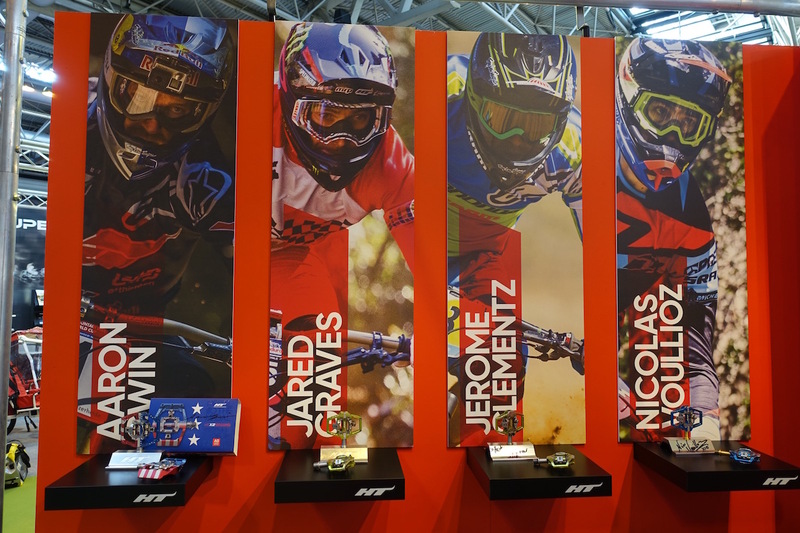 And riders such as Jared Graves and Nico Voullioz are well known for being particularly fussy when it comes to bike setup and component choice. 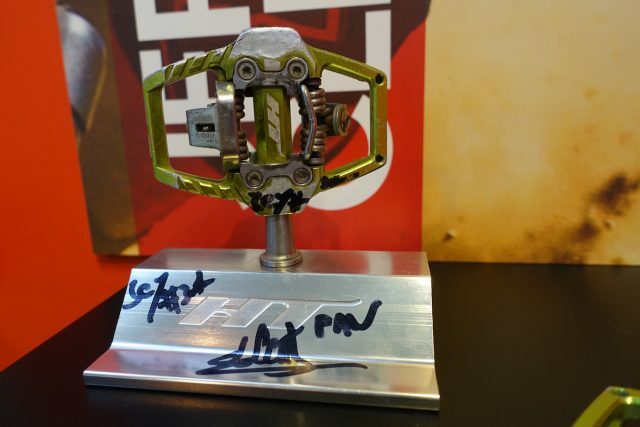 Properly ridden pedals from Aussie enduro shredder Jared Graves. Frenchman Nico Voullioz runs a titanium version of the HT Components T1 trail pedals. 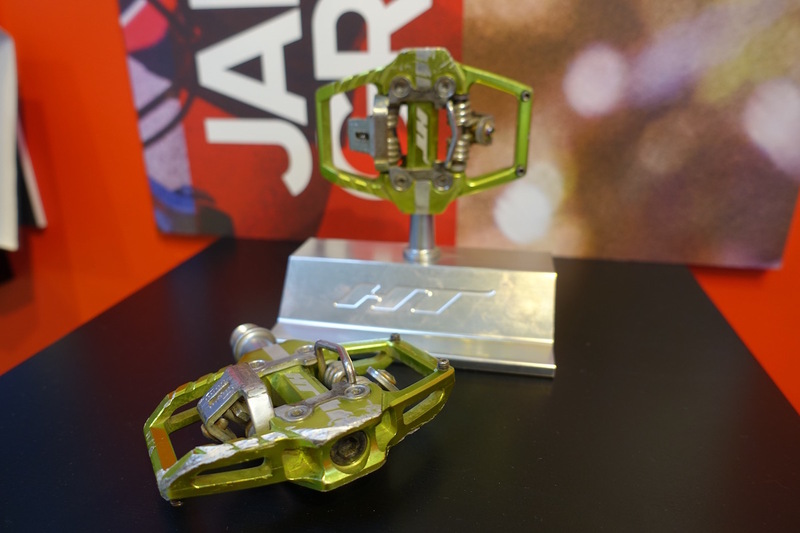 Jerome Clementz rocks a set of green T1 pedals to match his dashing Cannondale Team colours. 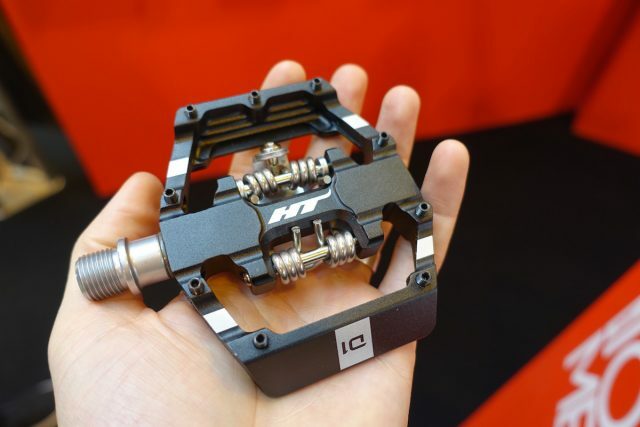 While not on display at HT Components booth at the Cycle Show, we were given a sneak peek at a new prototype called the D1 pedal. 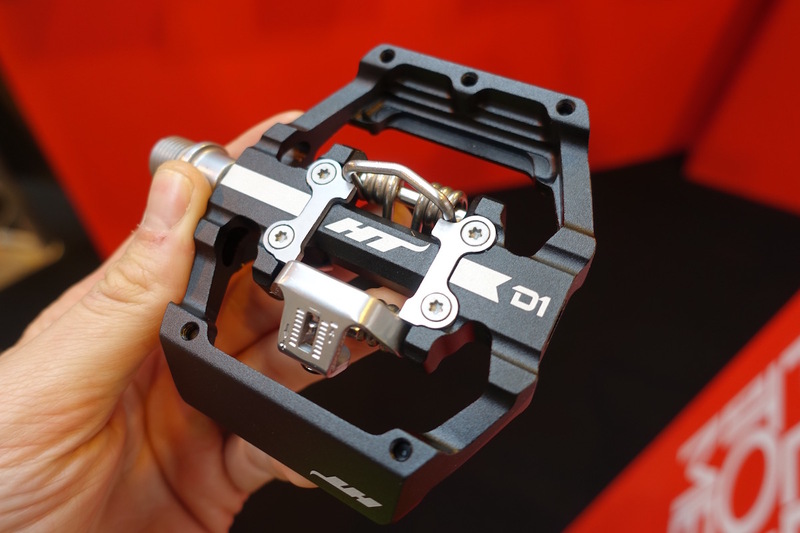 The D1 is a dual-sided pedal, which means it has a clip on one side, and a flat profile on the other. 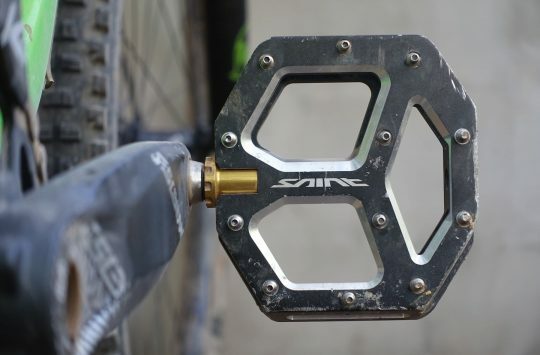 This is ideal for riders starting out on clipless pedals, who want to be able to rest their feet on top of the pedals without necessarily being clipped in. Proper flat profile on the other side of the prototype D1 pedals. Adjustable pins offer added grip that should work well with rubber-soled shoes such as the Specialized 2FO. Still a very thin stack height on the D1 pedal. Compared to other dual-sided pedals on the market, these look like some of the best we’ve seen. HT Components also makes lightweight XC pedals, which they call the M1. There are two versions available, with the base option running a chromoly axle and alloy body. The one pictured to the right will actually be all-black once production rolls through, which should give it a super stealthy look alongside all the black forks and shocks on many mountain bikes these days. The M1T uses the same clip design, but subs in a blingy gold Titanium axle to help shed weight. Each pedal weighs under 130 grams each. Not quite Eggbeater 11 weight, but damn close, and a whole load more platform. 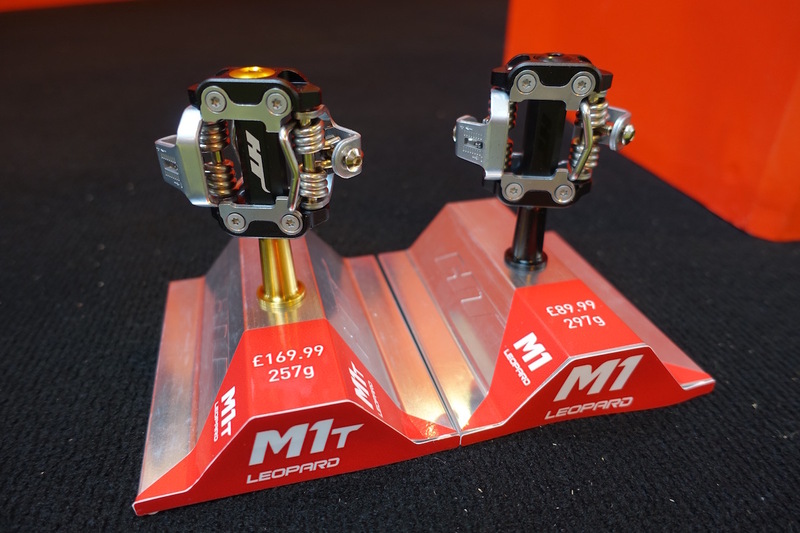 Like the new HT flat pedals, the M1 and M1T receive updated EVO+ internals, which combine needle roller bearings and IGUS bushings for smoother rolling and added durability. Stack height on the M1 pedal body is 17mm, so it’s decently thin. 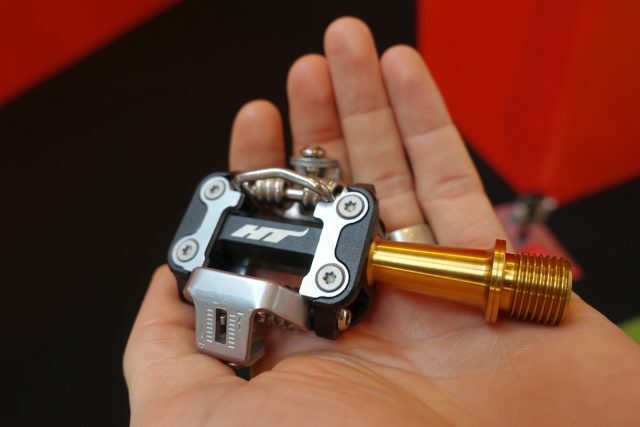 All HT Components clipless pedals are designed to be run with HT’s own cleat. 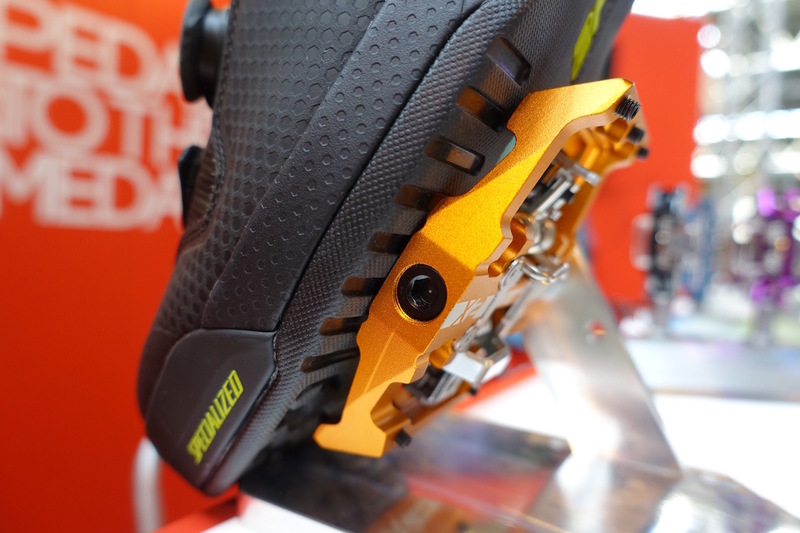 It kind of looks like a Shimano SPD cleat, but it isn’t the same. 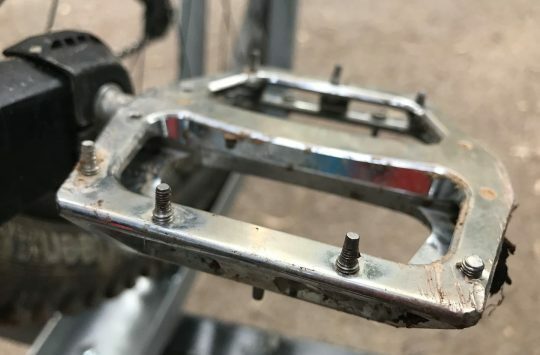 You can get two different cleats that offer two different release angles, which combined with the adjustable spring tension, means you can significantly alter the float of the pedal as needed.